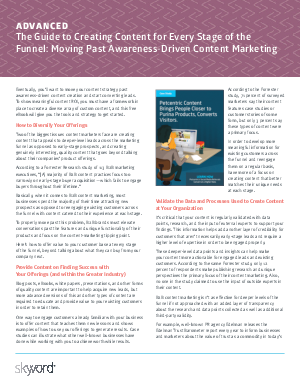 Two of the biggest issues content marketers face are creating content that appeals to deeper-level leads across the marketing funnel as opposed to early-stage prospects, and creating genuinely interesting, quality content that goes beyond talking about their companies’ product offerings. According to a Forrester Research study of 113 B2B marketing executives, “[A] majority of B2B content practices focus too narrowly on early-stage buyer acquisition—which fails to engage buyers throughout their lifetime.” Basically, when it comes to B2B content marketing, most businesses spend the majority of their time attracting new prospects as opposed to reengaging existing customers across the funnel with content catered to their experience at each stage. To properly move past this problem, B2B brands must elevate conversations past the features and unique functionality of their products and focus on the content-marketing tipping point. Here’s how to offer value to your customer base at every stage of the funnel, beyond talking about what they can buy from your company next.